Who’s Paying the Pro-War Pundits? 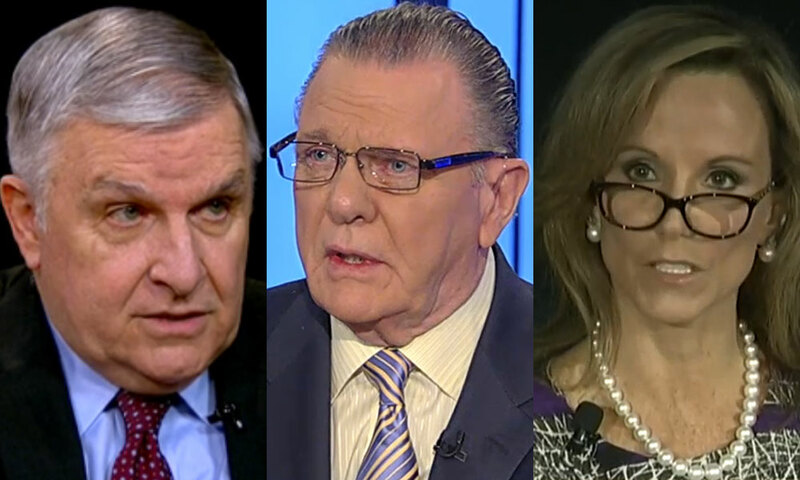 Talking heads like former General Jack Keane are all over the news media fanning fears of IS. Shouldn’t the public know about their links to Pentagon contractors? If you read enough news and watch enough cable television about the threat of the Islamic State, the radical Sunni Muslim militia group better known simply as IS, you will inevitably encounter a parade of retired generals demanding an increased US military presence in the region. They will say that our government should deploy, as retired General Anthony Zinni demanded, up to 10,000 American boots on the ground to battle IS. Or as in retired General Jack Keane’s case, they will make more vague demands, such as for “offensive” air strikes and the deployment of more military advisers to the region. But what you won’t learn from media coverage of IS is that many of these former Pentagon officials have skin in the game as paid directors and advisers to some of the largest military contractors in the world. Ramping up America’s military presence in Iraq and directly entering the war in Syria, along with greater military spending more broadly, is a debatable solution to a complex political and sectarian conflict. But those goals do unquestionably benefit one player in this saga: America’s defense industry. Keane is a great example of this phenomenon. His think tank, the Institute for the Study of War (ISW), which he oversees along with neoconservative partisans Liz Cheney and William Kristol, has provided the data on IS used for multiple stories by The New York Times, the BBC and other leading outlets. Keane has appeared on Fox News at least nine times over the last two months to promote the idea that the best way to stop IS is through military action—in particular, through air strikes deep into IS-held territory. 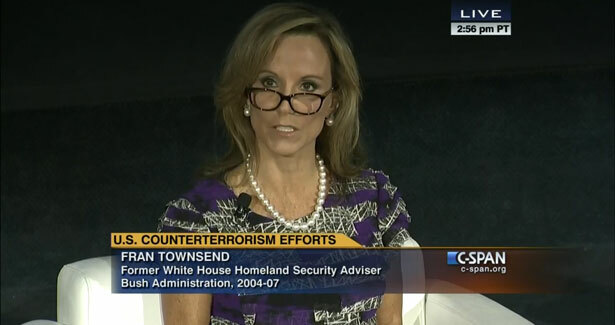 In one of the only congressional hearings about IS over the summer, Keane was there to testify and call for more American military engagement. On Wednesday evening, Keane declared President Obama’s speech on defeating IS insufficient, arguing that a bolder strategy is necessary. “I truly believe we need to put special operation forces in there,” he told host Megyn Kelly. Left unsaid during his media appearances (and left unmentioned on his congressional witness disclosure form) are Keane’s other gigs: as special adviser to Academi, the contractor formerly known as Blackwater; as a board member to tank and aircraft manufacturer General Dynamics; a “venture partner” to SCP Partners, an investment firm that partners with defense contractors, including XVionics, an “operations management decision support system” company used in Air Force drone training; and as president of his own consulting firm, GSI LLC. To portray Keane as simply a think tank leader and a former military official, as the media have done, obscures a fairly lucrative career in the contracting world. For the General Dynamics role alone, Keane has been paid a six-figure salary in cash and stock options since he joined the firm in 2004; last year, General Dynamics paid him $258,006. Keane did not immediately return a call requesting comment for this article. Disclosure would also help the public weigh Keane’s policy advocacy. For instance, in his August 24 opinion column for The Wall Street Journal, in which he was bylined only as a retired general and the chairman of ISW, Keane wrote that “the time has come to confront the government of Qatar, which funds and arms IS and other Islamist terrorist groups such as Hamas.” While media reports have linked fundraisers for IS with individuals operating in Qatar (though not the government), the same could be said about Saudi Arabia and Kuwait, where many of the major donors of IS reportedly reside. Why did Keane single out Qatar and ignore Saudi Arabia and Kuwait? Is it because his company, Academi, has been a major business partner to the United Arab Emirates, Qatar’s primary rival in the region? In a Washington Post story about Obama’s decision not to deploy troops to combat IS, retired Marine General James Mattis was quoted as a skeptic. “The American people will once again see us in a war that doesn’t seem to be making progress,” Mattis told the paper. Left unmentioned was Mattis’s new role as Keane’s colleague on the General Dynamics corporate board, a role that afforded Mattis $88,479 in cash and stock options in 2013. 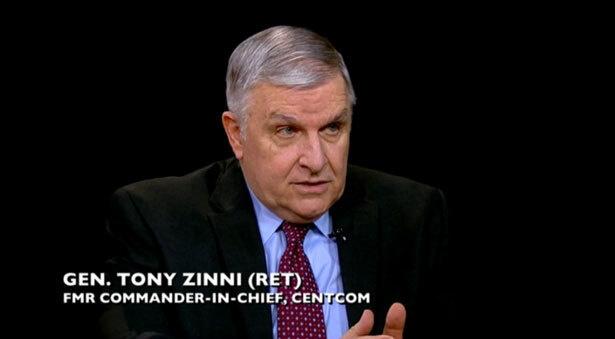 Retired General Anthony Zinni, perhaps the loudest advocate of a large deployment of American soliders into the region to fight IS, is a board member to BAE Systems’ US subsidiary, and also works for several military-focused private equity firms. “Mainstream news outlets have a polite practice of identifying former generals and former congressmembers as simply ‘formers’—neglecting to inform the public of what these individuals are doing now, which is often quite pertinent information, like that they are corporate lobbyists or board members,” says Jeff Cohen, an associate professor of journalism at Ithaca College. Media outlets might justify their omissions by reasoning that these pundits have merely advocated certain military strategies, not specific weapons systems, so disclosure of their financial stake in the policy need not be made. Yet the drumbeat for war has already spiraled into calls for increased military spending that lifts all boats—or non-operational jets for that matter. When the Pentagon sent a recent $2 billion request for ramped-up operations in the Middle East, supposedly to confront the IS issue, budget details obtained by Bloomberg News revealed that officials asked for money for additional F-35 planes. The F-35 is not in operation and would not be used against IS. The plane is notoriously over budget and perpetually delayed—some experts call it the most expensive weapon system in human history—with a price tag now projected to be over $1 trillion. In July, an engine fire grounded the F-35 fleet and again delayed the planned debut of the plane. How it ended up in the Pentagon’s Middle East wish list is unclear. “I think an inclination to use military action a lot is something the defense industry subscribes to because it helps to perpetuate an overall climate of permissiveness towards military spending,” says Ed Wasserman, dean of the UC Berkeley Graduate School for Journalism. Wasserman says that the media debate around IS has tilted towards more hawkish former military leaders, and that the public would be best served not only with better disclosure but also a more balanced set of opinions that would include how expanded air strikes could cause collateral civil casualties. ”The past fifty years has a lot of evidence of the ineffectiveness of air power when it comes to dealing with a more nimble guerrilla-type adversary, and I’m not hearing this conversation,” he notes. The pro-war punditry of retired generals has been the subject of controversy in the past. In a much-cited 2008 exposé, The New York Times revealed a network of retired generals on the payroll of defense contractors who carefully echoed the Bush administration’s Iraq war demands through appearances on cable television. The paper’s coverage of the run-up to a renewed conflict in the region today has been notably measured, including many voices skeptical of calls for a more muscular military response to IS. Nonetheless, the Times has relied on research from a contractor-funded advocacy organization as part of its IS coverage. Reports produced by Keane’s ISW have been used to support six different infographics used for Times stories since June. The Times has not mentioned Keane’s potential conflict of interest or that ISW may have a vested stake in its policy positions. The Public Accountability Initiative notes that ISW’s corporate sponsors represent “a who’s who of the defense industry and includes Raytheon, SAIC, Palantir, General Dynamics, CACI, Northrop Grumman, DynCorp, and L-3 Communication.” As the business network CNBC reported this week, Raytheon in particular has much to gain from escalation in Iraq, as the company produces many of the missiles and radar equipment used in airstrikes. ISW’s willingness to push the envelope has gotten the organization into hot water before. In 2013, ISW suffered an embarrassing spectacle when one of its analysts, Elizabeth O’Bagy, was found to have inflated her academic credentials, touting a PhD from a Georgetown program that she had never entered. But memories are short, and the media outlets now relying heavily on ISW research have done little to scrutinize the think tank’s policy goals. Over the last two years, ISW, including O’Bagy, were forcefully leading the push to equip Syrian rebels with advanced anti-tank and anti-aircraft weaponry to defeat Bashar al-Assad. For Keane, providing arms to Syrian rebels, even anti-American groups, was a worthwhile gamble. 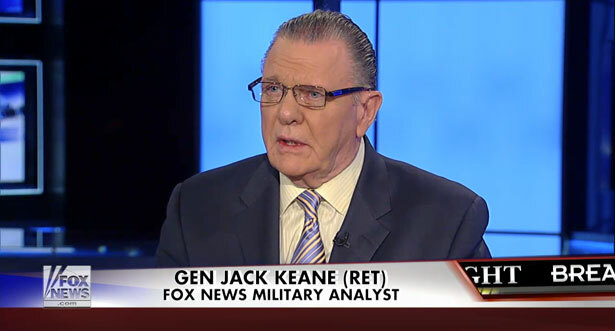 In an interview with Fox Business Network in May of last year, Keane acknowledged that arming Syrian rebels might mean “weapons can fall into radical Islamists’ hands.” He continued, “It is true the radical Islamists have gained in power and influence mainly because we haven’t been involved and that is a fact, but it’s still true we have vetted some of these moderate rebel groups with the CIA, and I’m convinced we can—it’s still acceptable to take that risk, and let’s get on with changing momentum in the war.” That acceptable risk Keane outlined has come to fruition. Recent reports now indicate that US-made weapons sent from American allies in the region to Syrian rebels have fallen into the hands of IS. Keane, and ISW, is undeterred. The group just put out a call for 25,000 ground troops in Iraq and Syria.